Spring training facilities for the Milwaukee Brewers have been a hit with players and fans, but in 2019 they look to be a home run. 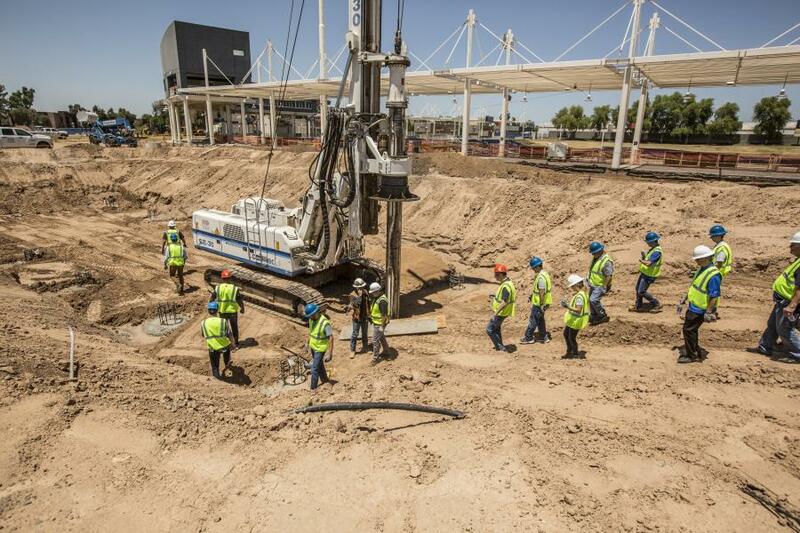 Construction is moving ahead on a $60 million renovation and expansion of Milwaukee Brewers' spring training home in the western Phoenix community of Maryvale, Ariz. The ballpark sits on 60 acres at 51st Avenue and Indian School Road. 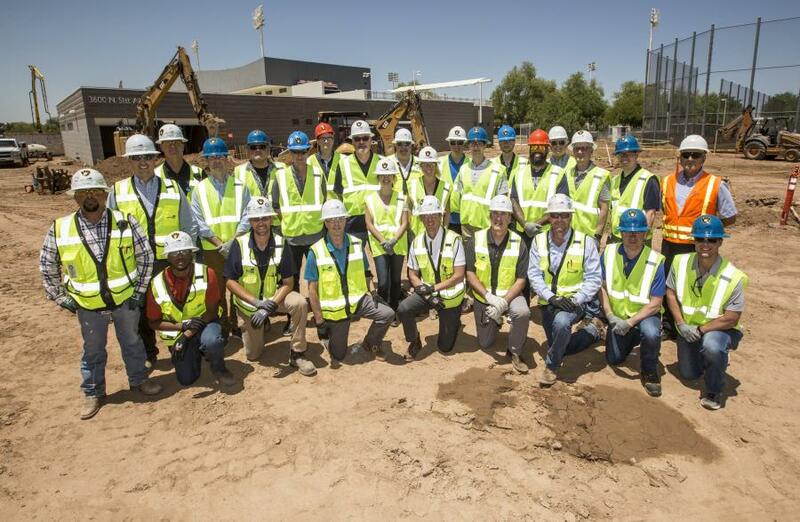 During last season's spring training session, Rick Schlesinger, chief operating officer of the Milwaukee Brewers; Tyler Barnes, senior vice president of communications and affiliate operations of the Milwaukee Brewers; Craig Counsell, manager of the Milwaukee Brewers; and Eric Thames, first baseman of the Milwaukee Brewers, joined other staff to view the construction site. Like a good game strategy, plans came together. "We started work immediately after the final 2018 spring training game," said Barnes. "We expect to have substantial completion by mid-January." The original stadium dates back to the late 1990s. "This is a renovation with significant additions, but not a completely new facility," Barnes said. 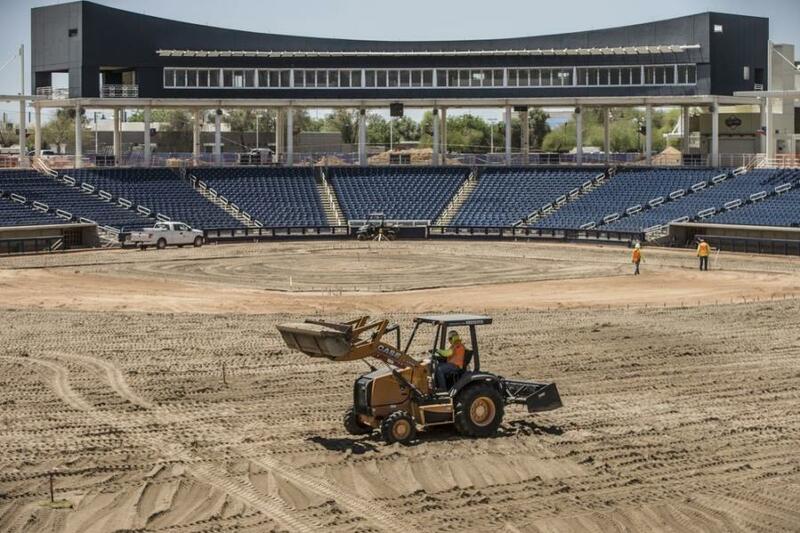 "Maryvale Baseball Park served as a great home to the Brewers for two decades, but as our operations grew, we were challenged for space, amenities and infrastructure." Mortenson Construction of Minneapolis is prime contractor and HKS of Los Angeles is the architect for the combined public-private project. Mortenson is known for its project consulting, project delivery and facilities management. The Brewers declined to name subcontractors for the project. In November 2017, the baseball club reached an agreement with the city of Phoenix to remain at Maryvale for another 25 years. Maryvale Baseball Park opened in 1998 on more than 60 acres. 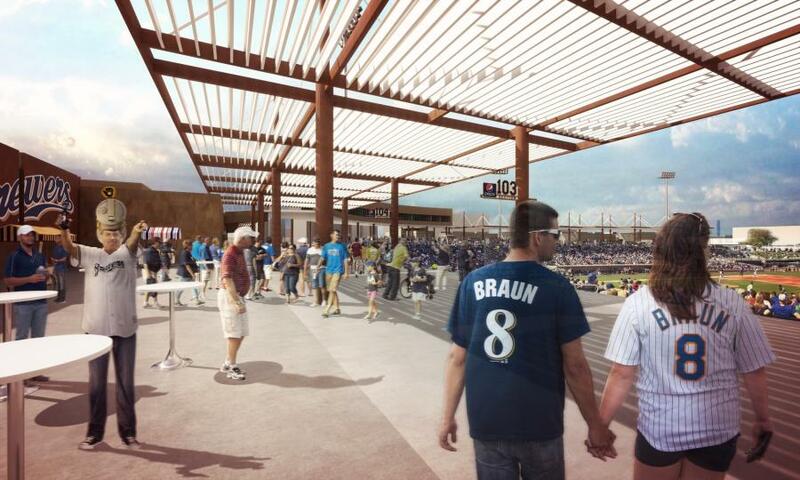 The Milwaukee Brewers will foot most of the bill for the project. The city of Phoenix will allocate $2 million per year over the next five years and the Arizona Sports and Tourism Authority will contribute about $5.7 million. What fans will see is a bigger, better overall facility. The existing Major League and minor league buildings total about 41,000 sq. ft. The comparable space in the new construction and renovation will approximately double that to 82,000 sq. ft.
Fifteen major league teams spring train in the Valley. Cactus League baseball is a major tourism and spending driver for the region each year. 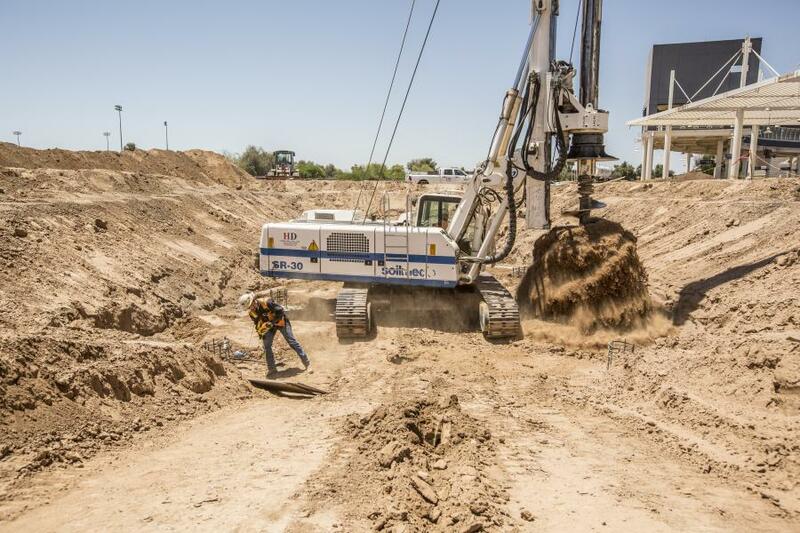 For this construction project, the building's walls are poured directly at the job site in large slabs of concrete called "tilt-up panels" or "tilt-wall panels". The panels are then raised into position around the building's perimeter forming the exterior walls. "The schedule is tight but we are seeing excellent progress every day," Barnes said. Asked to describe the renovation, he said size and convenience were big factors. "The old facility had separate buildings for the Major League and Minor League operations," Barnes said. "The renovated facility will bring all of that under one roof in a much larger footprint. We also took down the entire third base concourse and are rebuilding that with new ticketing, concessions, back-of-house offices and restrooms. We are building a new agility field, expanding one of the half fields into a full-size replica of Miller Park, and investing heavily in technology and training facilities." Other areas of the stadium also are being refreshed to blend with the renovated areas, and all the playing fields will be replaced in a three-year cycle. Heavy equipment is on site including loaders, pile drivers, backhoes, bulldozers and delivery trucks. Part of renovation of the stadium includes modernization. Fixed seats will replace the existing benches in the stadium and a new scoreboard will be put in place. Navy blue and desert tones are the primary color scheme on the new stadium. Barnes said little will change in the dimensions of the main playing field. It will hold 10,000 fans and feature a grass surface. Field dimensions are 350 ft. in left field, 400 ft. in center field and 340 ft. in right field. The stadium will have adequate parking, Barnes said. It will have one primary lot and several smaller lots — including some new lots — for public parking. The ball club owns the vast majority of available parking, he said. The renovated stadium includes a new clubhouse building, featuring locker rooms, concessions, restrooms, shops, ticketing and support areas. A new stand-alone, two-story building will be constructed, running the length of the area from an updated home plate gate plaza to a connection with the existing Major League clubhouse building. This building will house new locker rooms, training spaces and support functions for the Major and Minor League teams; a new flagship retail sales store; and a new primary ticket office at the new home plate gate. The north side of the building will be home to new concession stands and restrooms as the first base concourse will be widened to accommodate better pedestrian traffic. A second floor will be constructed to house new offices for baseball operations and will feature a walkout patio with views of training facilities to the south. The existing Minor League building will be demolished, as will the structure that ran along the first base side of the stadium that housed the various game-day services offices, commissary, restrooms, maintenance and concession stands. The existing shade structures will remain on both the first and third base concourses. A new entry plaza will be created behind home plate and will feature the primary ticket office and gates to the stadium. It is expected that the majority of fans will enter the facility through this new plaza. The east side of the plaza area will include the lobby entrance to the new clubhouse building. In addition, there will be the entry to the new retail store from outside of the home plate gate, allowing fans access to the store during non-game times. The existing Major League clubhouse will be renovated to include facilities for psychological services, sports science, maintenance, grounds, a new right field gate, ticket office and vendor commissary. The existing upper level will become business operations offices and will have new finishes. New building services include new lighting and phone-data low voltage systems. A new high-performance natural turf practice field will be constructed at the site of the existing half field to the east. The new field will have dimensions and layout matching Miller Park in Milwaukee. New or refurbished parking lots will be created in three places: A new lot along 53rd Avenue will replace what is currently known as Lot C. The new lot — similar in capacity to Lot C — will be constructed primarily on the site that now houses the Minor League building. There will be two additional lots on the east side, closer to 51st Avenue. One of the lots will be new to accommodate Major League players and have capacity for 100 spaces; it also will be covered to protect from foul balls. The third will be a refurbishment of an existing lot just south of the new covered parking. New landscaping and associated irrigation will be installed throughout the complex. The materials will follow an "Oasis" theme with a goal to provide improved aesthetics, help define circulation paths and use areas. A new commissary for cooking, refrigeration and dry storage and a new visiting team-umpire clubhouse will be constructed on the third base side, outboard of the existing concourse structures. The new building will have vehicular access from 53rd Avenue to the western side of the commissary building. Part of the renovations include a "learning lounge" where free tutoring will be offered to neighborhood students via a partnership between the Brewers and Grand Canyon University.